This research reports provides insights on how fluid dynamics simulations are applied in design and the impact they have on business performance. Not that long ago, Computational Fluid Dynamics was a real of PhD experts. It was something that was essentially inaccessible to the common engineer. But today, through several advances in CFD simulation technology, that story is very different. This eBook provides an up to date glimpse at how CFD simulations are being used in the concept and detailed design stages of product development. This eBook is best for engineering managers overseeing teams that are designing products influenced by fluid dynamic effects. This eBook is relevant for companies of all sizes in discrete manufacturing industries. In recent years… accessibility of fluid simulation technologies has changed dramatically. Automated meshing functionality has improved greatly, improving the accuracy of simulation results. The technologies have become more closely integrated with Computer Aided Design (CAD) tools, improving the setup of simulation models and closing the loop of design improvement. In all, these changes have made fluid simulation far more accessible to everyday engineers, but questions still remain. Just how accessible are these tools? What are their purpose in the design cycle? What are the biggest challenges to their use? Answering those questions was the purpose of the 2013 Simulation Driven Design study. Conducted by Lifecycle Insights in the Fall 2013, the study’s survey collected 1,005 responses with respect to the goals, challenges, practices, and adoption of technology for three simulation topics: concept simulation, detailed design simulation, and simulation management. 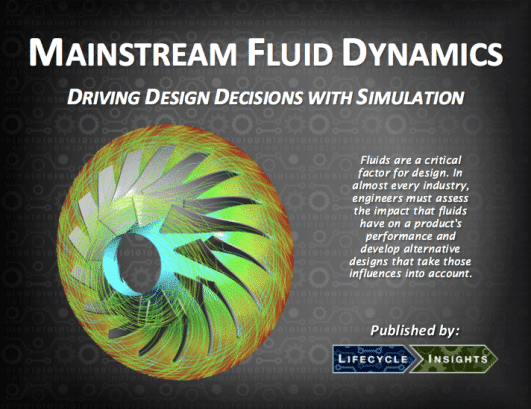 This eBook reveals the findings related to the application of fluid simulations in the design cycle from that study, explaining and putting them into context. Specifically, it details the study’s findings related to the impact of failed prototypes, the top organizational objectives, the most frequent applications as well as the most common practices related to fluid simulation.